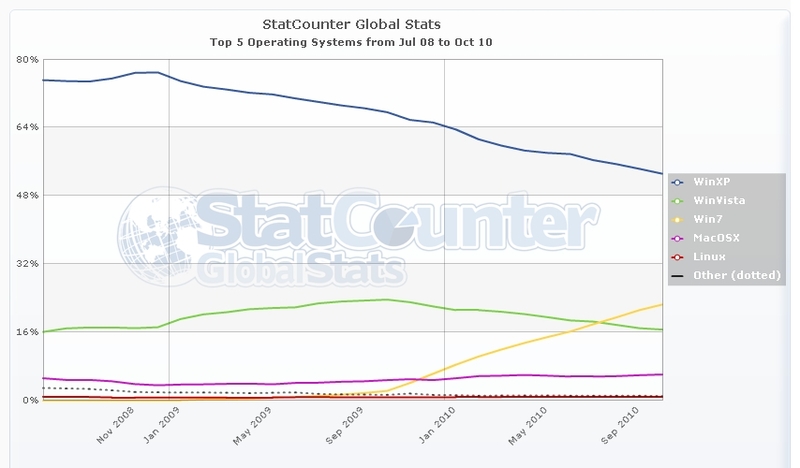 Here is an interesting graph showing the top 5 Operating System market shares. Microsoft Windows still has huge dominance and whilst Apple has received so much hype about their Laptops/Macbooks, this hasn’t actually caused a considerable increase in their market share. Windows 7 is growing very strongly as users replace Windows XP and Vista operating systems. So Microsoft has a total of 92.18% of the Operating System market. Personally i am a big Microsoft fan, but there is no bias in this article – the figures do the talking. It will be interesting to follow the Operating System market shares and I will post subsequent articles as more unfolds.